Yamaha-Triumph-KTM of Camp Hill is Central Pennsylvania’s #1 Powersports dealership. They strive to build a long-term, relationship based on trust and respect with all their customers. With over twenty-five years of experience, local powersports enthusiasts know that they can count on quality products and services any time they visit Yamaha-Triumph-KTM of Camp Hill. Duane Summers, Dealer Principal, knows that one of the best ways to continue building those relationships is to let the local enthusiasts know where to go when they are searching for a local powersports dealer. But, experience is as important for Duane as it is for his customers. Quality experience means choosing a marketing partner that knows both the powersports industry and the marketing channels that generated a proven, positive ROI. 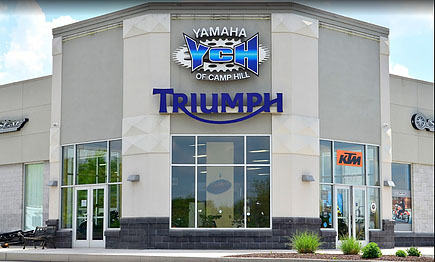 Yamaha-Triumph-KTM of Camp Hill has been using the Local Web Dominator program to help with lead generation, reputation management and search engine marketing. By taking advantage of the vast industry knowledge and Google AdWords expertise in the PSM Digital Marketing department, Duane has been able to generate quantifiable results from his campaign. He’s able to maintain a lean, targeted budget that generates a positive ROI each month. Additionally, the campaign increased their website traffic by 12% all quarter. And, to really show off, the campaign had a 12% average click through rate as well (Google considers anything over a 2% CTR to be a good campaign). So, it seems that 12 is Duane’s lucky number so far this year. It’ll be exciting to see how those numbers respond once we’re in the full swing of the riding season. Does your current digital marketing strategy generate a 12% increase in quantifiable web leads? If not, we’d love to help you create a campaign that generates the kind of positive ROI that Duane at Yamaha-Triumph-KTM of Camp Hill is seeing, even in the ‘slow season’. Call us today at 877-242-4472 or request a Free Demo at www.powersportsmarketing.com/local-web-dominator, so we can walk you through the benefits of the Local Web Dominator program.